(Kansas City, Mo. 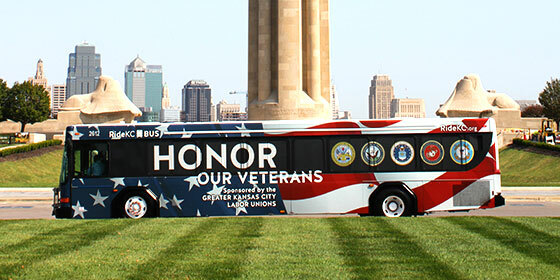 – Nov. 9, 2017) In honor of Veterans Day, RideKC reminds area veterans that free fare is available every day with the RideKC Veterans Pass. The Free Fare for Veterans program began in April of this year, and the program has provided more than 500,000 rides and distributed more than 3,500 passes. KCATA, in partnership with the Kansas City Veterans Administration and the Veteran Community Project (VCP), honors veterans through this program. The initiative is sponsored by the Greater Kansas City Labor Unions/AFL-CIO. U.S. Army veteran Dana Purnell has been using the RideKC Veterans Pass for several months. Area transit providers will operate regular Saturday service on Veterans Day, Nov. 11, and regular weekday service on the day before Veterans Day, Friday, Nov. 10. In observance of the holiday, KCATA administrative offices will be closed on Friday, Nov. 10. However, the Regional Call Center and the RideKC Freedom offices will operate normal hours on Friday. For route information, contact the Regional Call Center at (816) 221-0660, weekdays from 6 a.m. to 7 p.m., or visit us at www.ridekc.org.